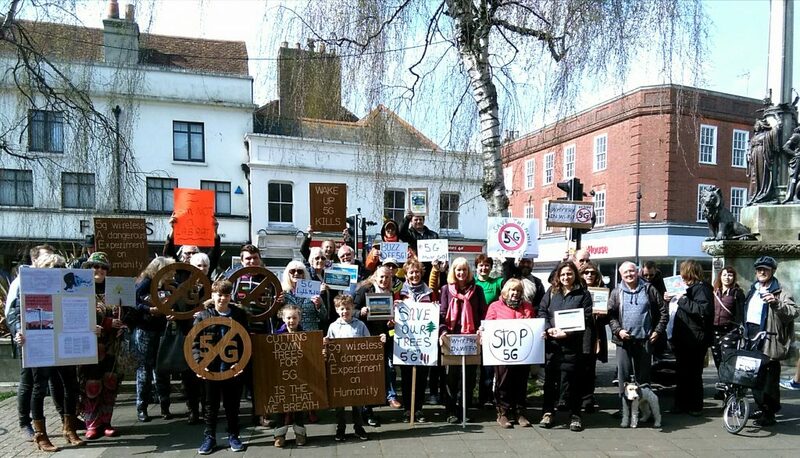 The Isle of Wight Stop5G Demo today was great! I have sent you pictures, but if they haven’t arrived, they might be in your SPAM. The pictures clearly show the concern from young and old about a Technology which is being rolled out without Due Diligence, i.e. without Strategic Health or Environmental Impact Assessments and without any Public Consultations, i.e. without public consent. To expose people and wildlife to 24/7 pulsed millimeter wave radiation is in clear breach of the Precautionary Principle and of our Human Rights, which are enshrined in UN Law. People across the world are standing up and raising their voices and Brussels, Rome, The Netherlands + most recently Florida have put a halt to 5G until more research has been conducted, in line with the plea from many thousands of scientists across the Globe. This is not “tin foil” nonsense, as our Council Leader will have us believe, but serious concern based on serious science. Our next Stop 5G meeting will be Sunday 14th of April 3pm at the Unitarian meeting House, opposite County Hall in Newport.